The Indian retail sector has undergone significant changes, given the economic development and growing consumerism. Various store and non-store retail formats have evolved to cater to this budding market and direct selling is one such non-store retail format. According to a report on “Socio-Economic Impact of Direct Selling: Need for a Policy Stimulus” from Indian Council for Research on International Economic Relations (ICRIER) in association with IDSA, direct selling refers to the selling of goods and services to the consumers away from a fixed retail outlet, generally in their homes, workplace, etc, through explanation and demonstration of the product by direct sellers. This sector is one of the fastest growing non-store retail formats, recording double-digit growth in the post-reform period. The report also suggested that there are broadly four areas that need government intervention – the provision of a clear definition of direct selling; streamlining of the foreign direct investment (FDI) policy; the enactment of a governing legislation for the sector and the establishment of a nodal ministry or single point of contact. Chavi Hemanth, Secretary General, IDSA expressed, "Direct selling in India has maintained its continuous growth, the sector is growing at around 20 per cent. The industry has also witnessed growth in the number of direct sellers, the numbers have increased by 12 per cent. The independent sales consultants also known as direct sellers find direct selling industry as a major income source, result shows that around 88 per cent of males and 80 per cent of female are completely satisfied with this mode of selling." She further stated, "The sector promises self employment opportunities and direct selling industry could also play a significant role in fulfilling the government’s aim that is to create employment opportunities for 50 crore people in gainful self employment by 2020." The growing Indian market has attracted a large number of Indian and foreign direct selling companies, such as Altos Enterprises Ltd, AMC Cookware (India) Pvt Ltd, Amway India Enterprises, Avon Beauty Products India Pvt Ltd, CNI Enterprises Pvt Ltd, Daehsan Trading Pvt Ltd, Forever Living Products Pvt Ltd, Herballife International India Pvt Ltd, Hindustan Unilever Network, Modicare Ltd, Oriflame India Pvt Ltd, Tupperware India Pvt Ltd, New York Life Insurance Co Ltd, Shriram DTH Pvt Ltd, K-Link Healthcare (India) Pvt Ltd, Mary Kay, Alken International, Jafrs Ruchi Cosmetics and 4 Life Trading Ltd.
One of the crucial areas that direct selling companies need to address is the best and most feasible way of reaching out to their target customers. These stores do some great business despite not having a physical store presence in the market. We connected with a few direct selling companies to understand the science behind the same. At Oriflame, it is their people and monthly catalogues that come handy as their biggest tools of promotion and advertising. “We do advertising primarily in women’s magazines and majorly promote our products through events, media tie-ups and digital promotions,” said Sharmili Rajput, Marketing Director, Oriflame India. At Mary Kay, independent business owner/independent beauty consultants connect with potential customers one-on-one, in groups or by referrals from existing customers who are satisfied with the service offered by their beauty consultant. When a customer sends an online request via the Mary Kay website to learn more about the brand or to get a personalised free skin care consultation, the company connects an independent beauty consultant with the customer within one working day after receiving the email request. Also, at Oriflame India, each and every consultant is like an individual brand ambassador, helping the brand to reach out to its potential customers. “We invest a lot on events, trainings, seminars et al to groom our consultants as our business essentially thrives on word-of-mouth publicity. We launched our new website two years ago, and today our online ordering share is over 90 per cent,” said Rajput. At Oriflame, while the delivery of a Cash-on-Delivery order takes around 24-48 hours, the courier orders depend primarily on the delivery location. For remote areas, delivery may take as long as 7-8 days. For instance, in places like Uttarakhand, the time taken can be around 8 days. For the first time users, Oriflame’s strategy has always been to let the product speak for itself. “Once the customer has used our products, all we need to do is make them aware and informed about the product range that we offer, which is taken care of by our well trained consultants and beauty experts – global and local,” shared Rajput. To enhance customer experience, Oriflame provides personalised and professional beauty tips to its discerning consumers for selecting the right product. Also, Oriflame holds regular training sessions and beauty academies for consultants on products and beauty that help them to engage more and more customers. Mary Kay also invests in continuous education and skill up-gradation of its independent beauty consultants, so that they can, in turn, offer their customers the best product recommendation as well as customer service. “When it comes to selling, our founder, Mary Kay Ash, believed in one-on-one service, building a strong relationship with customers and always providing them with superior customer service,” said Hina Nagarajan, Country Manager, Mary Kay Cosmetics Pvt Ltd.
From introducing catalogues, to providing consultation, to making use of social networking sites, direct selling has thronged the selling space like never before. As a routine, direct selling companies come out with promotions and offers in catalogues, which are used by consultants to attract more customers. “Regular training sessions of consultants ensure that all customers are well informed and updated about Oriflame products. Our consultants cater to the specific needs of our customers and suggest Oriflame products that suit them best,” commented Rajput. “Apart from that, our Facebook page and Twitter handle relay updates on our product offerings on a daily basis and are very useful in establishing a personal connect with the customers. Events are another platform that gives us an opportunity to build strong relations with our existing and potential customers through demonstration and exciting engagement activities,” added Rajput. At Mary Kay, beauty consultants usually communicate with their customers through one-on-one meetings, emails, phone and while conducting personalised skin care classes. “A customer can also visit our website to know more about the new product launches every month,” opined Nagarajan. Direct selling is a concept that emerged in the West and is a fast growing sector in India. The awareness of Indian consumers about the benefits of direct selling has increased. Direct selling is expected to see a constant value CAGR of 9 per cent in the next 4-5 years. As shared by Mary Kay, direct selling increased by 17 per cent in value terms in 2010 to reach the Rs 49.6 billion mark. The beauty and personal care market is growing rapidly due to the impact of the economic growth in India, resulting in sharp rise in salaries. This has resulted in consumers having more money to spend on cosmetics and toiletries. The sector is estimated to have touched 5,409 million euro in 2010 and is growing at a rate of 13 per cent, in a way outpacing the growth of the retail sector. 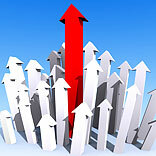 According to a study by Ernst & Young, the Indian direct selling industry is set to touch Rs 7,120 crore by 2012-13. By the end of 2009-10, the size of the industry was Rs 4,120 crore, growing at a rate of 24 per cent. The industry is poised to grow at the rate of 20 per cent per annum till 2012-13. India is the 23rd largest direct selling country in the world.